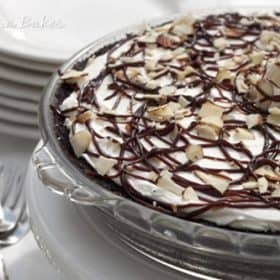 I started out making a Mounds pie, a chocolate crumb crust with a luscious, creamy coconut filling drizzled with hot fudge. After spreading the sweetened whipped cream on top though, the pie just looked like it needed almonds. So in the end I guess I made an Almond Joy pie for this month’s Secret Recipe Club. Dee, at Deelicious Sweets, is my secret blogger for the month. 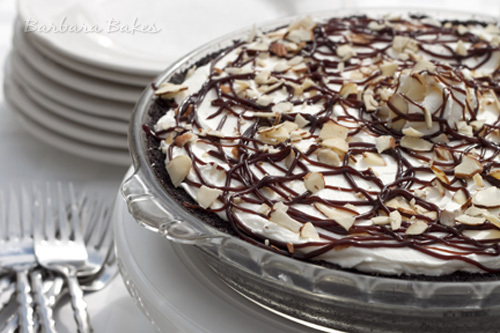 Her Heart Skippity Double-Coconut Cream Pie sounded heavenly and her Pudgy Fudgy Peanut Butter Pie looked irresistible. 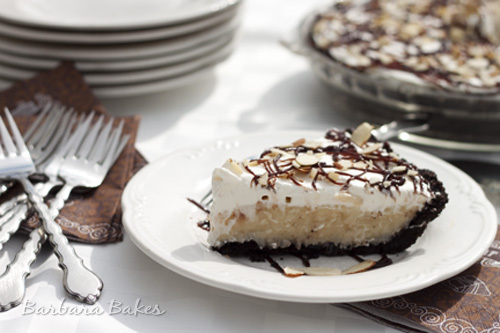 It was so hard to pick just one, so I decided to combine the two and my Almond Joy pie was born. My daughter described this pie as amazing, rich and yummy. My husband said is was scrumptious. I, of course, would have to described it as deelicious! I loved looking at all the Deelicious Sweets at Dee’s, but she’s got a wonderful collection of savory recipes as well. Do yourself a favor and pop over and check them out. In a medium saucepan combine sugar, cornstarch, and salt. Stir in milk and cream of coconut. Cook and stir over medium heat until thickened and bubbly. Cook and stir for an additional 2 minutes stirring constantly. Gradually add about 1 cup of the hot milk mixture into the beaten egg yolks, stirring constantly. Return all of the mixture to saucepan. Cook and stir until bubbly. Cook and stir for an additional 2 minutes. Remove from heat. Stir in margarine or butter until melted. Stir in coconut and vanilla. Pour hot filling into cooled chocolate crumb crust. Cover and chill 3 to 6 hours before serving. Before serving top with whipped cream (I used stabilized whipped cream because I wasn’t serving all of it right away), drizzle with hot fudge and sprinkle with crushed sliced almonds. In medium bowl, combine all ingredients until evenly moistened. Press mixture firmly into bottom and up sides of 9-inch pie plate. Bake until firm, about 8 to 10 minutes. Cool completely before adding filling. Combine cocoa powder, sugar, corn syrup, light cream, salt and butter in a small saucepan, and cook over medium heat, stirring constantly, until mixture comes to a full boil. Boil briskly for 3 minutes, stirring occasionally, then remove from heat, and stir in vanilla. The sauce may be stored, refrigerated in an airtight, heatproof container for up to 1 week. To reheat, place the container of sauce in a pan of hot, but not boiling, water until the sauce warms and thins to a pouring consistency. In small glass bowl (I used a custard cup) combine cold water and gelatin. Let it sit for 2 minutes. Combined whipping cream and sugar in mixing bowl and begin to whip. Slow drizzle in the dissolved gelatin. Beat until soft peaks form. Barb, what is cream of coconut? I was looking for a coconut cream recipe that was as good as I had tasted in a particular restaurant. This recipe was definitely it.